Whether you are hosting an outdoor concert, awards gala, graduation, or kid’s birthday, you are officially involved in event planning. As the cooler weather rolls in, it’s important to have a strategy to keep your guests warm as the sun goes down. Rather than have all the guests shuffle indoors, utilizing patio heater rentals can be a cost-effective way to maintain a seamless flow of outdoor enjoyment. When making a decision about heater rentals, think about the type and capacity based on two criteria: Enclosed and Open-Air events. To properly heat a tented event, you will need about one heater for every 1,500 square feet. That average can shift depending on several factors, including how many guests, height of the tent, and the ventilation method. If you have open ends to the structure, that number may trend lower. If you are using screen mesh material and roof ventilation, you may need less heaters. 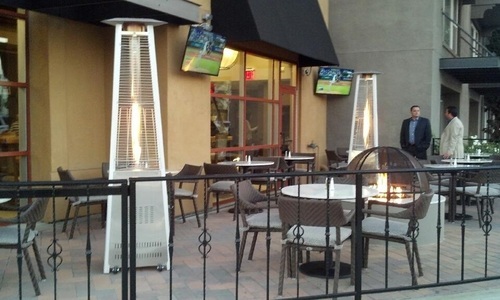 AEI has two lines of commercial and residential grade propane heaters called Sunglo and Patio Comfort that fit the bill. Their vertical lines stand 12 feet high, generate 40,000 BTUs and they last 10 hours. The Sunglo lines comes in stainless, black, and bronze to blend with your party décor. While Patio Comfort has stainless, bronze, jet-silver, and vintage styles. If you are hosting a semi-enclosed event, meaning roof only, you may need to increase the number of propane heaters to about one every 12-15 feet. Things such as temperature and wind will need to be factored into your heating calculations. By incorporating patio heater rentals into your event planning, your enclosed gatherings can run deep into winter. Open-air events are terrific during the summer and fall months. In warm southern states, you may be able to comfortably run them into winter with a little help from your local patio heater rentals outfit. Both Patio Comfort and Sunglo lines are uniquely suited for this type of event planning. Heaters from either line will be both visually appealing and last the entire party. You can place the heaters about 12 feet apart, depending on conditions. One of the things that experienced event planners learn is that heater rentals also act like magnets as the evening cools. Your guests will automatically seek the comfort provided by the propane heaters. That presents a strategic opportunity for you as the event planner. By centralizing intimate group seating arrangements and food near the heat sources, you will pull your guests together. While exciting food, beverages, and entertainment are key factors, a great party is always about the terrific people. Whether you are a parent hosting a graduation party, a friend helping to organize a wedding reception, or a professional event planner, propane heater rentals are an excellent and cost-effective way to ensure that guests remain comfortable from beginning to end.